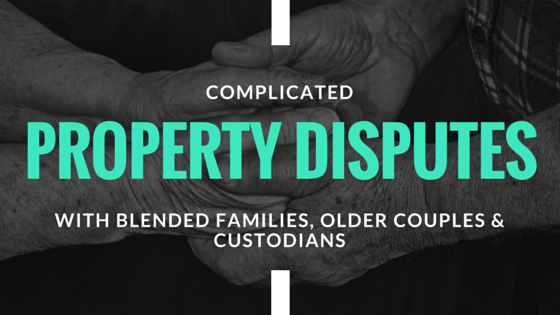 As the Population Ages Does Divorce and Property Become More Complicated? By now, we would all have some exposure to the legal proceedings that follow a divorce, if you haven’t gone through one yourself, you know a friend or relative who has. One thing that seems to be true is that no two divorces are the same. Some are resolved peacefully and without incident, with custody arrangements and property sales being quietly arranged behind closed doors, all finalised with a handshake and a good day. Some are pure combat from day one, with both parties at each other’s throats, taking no prisoners. Others still start out amicable, only to turn acrimonious, often much to the surprise (or not!) of everyone involved. Much less frequently, it might even happen the other way around. Then you’ve got all the other factors; the length of the marriage, the kids, and yes, the property. There are so many variables, but you’d have to imagine that the one thing these legal disputes all have in common is that the couple are actually getting a divorce, right? Consider the following family court case that last year made it all the way to the High Court. A couple, Mr and Mrs Stanford (names changed), were married in 1971. They both had children from previous marriages, as well as property. In the subsequent years, Mrs Stanford sold her property to one of her daughters. Both Mr and Mrs Stanford had wills bequeathing their property to their respective offspring. The property in which the couple lived was registered under Mr Stanford’s name. At the end of 2008, Mrs Stanford had a stroke, and was moved into residential care. She was also suffering from dementia. One of her daughters was appointed her guardian, following proceedings in the State Administrative Tribunal in Perth. However, in 2009, the story takes a turn. One of the daughters, in her capacity as Mrs Stanford’s case guardian, submitted an application to the Family Court of WA, asking for a property settlement. The application called for the sale of the property in which Mr Stanford was living, and then an equal division of the net proceeds between Mr and Mrs Stanford. What’s so particularly notable about this case is that, apparently, the couple were still happily married, albeit physically separated by the fact that Mrs Stanford had been moved into care. The Family Court of Western Australia, on first instance, ruled that Mrs Stanford was entitled to 42.5 per cent of the assets of the marriage, and that the sum (around $613,000) be paid in cash within 60 days. The ruling was appealed, and eventually reached the High Court. They dismissed the application made on behalf of Mrs Stanford, accepting the argument of Mr Stanford that the court should not determine property interests of parties in an intact marriage when neither of them had requested it. It is tempting to view this case as a curiosity: something interesting from a legal point of view, but with facts too rare or specific to be of any broader importance. However, demographic trends in Australia suggest that these sorts of issues might crop up more regularly in future. With second marriages far more common, and an ageing population, the courts may have to consider the questions raised in this case with far greater regularity.